When I was little, my mom went through a popular course called, The Image of Loveliness. It was all about knowing what colors and styles worked best on your individual features. You were either a 'summer', 'spring', 'winter', or 'autumn' based on your coloring. I've always said this house is a summer house. It shows it's best when the sun is shining and bright. We've had an unseasonably warm spring, and all the spring flowers are bursting. My snowball bushes are finally getting huge, and it's fabulous to step out into the yard and cut these beautiful blooms to bring inside. I especially love our living room and dining room this time of year. It's airy, light and cheery- and opening the windows to let the fresh air in just makes my heart happy. This pretty marble base candelabra is a new addition to my dining room- it was a piece I took with me to The Farmhouse Show, but I'm going to enjoy it for a few days before taking it into the shop. 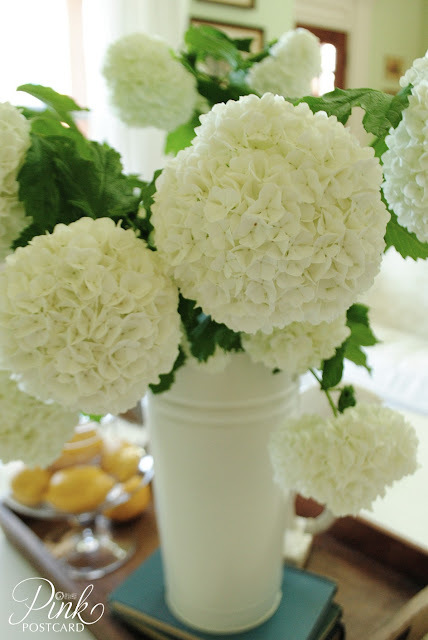 The snowballs also make a nice bouquet in my French flower bucket in the living room. I love that snowballs are so casual and carefree- hinting at warmer days of summer, just around the corner. Such a pretty, generous flower. Easy and carefree. In 5 years, they've grown from a 3 foot plant, to a 10 foot hedge. 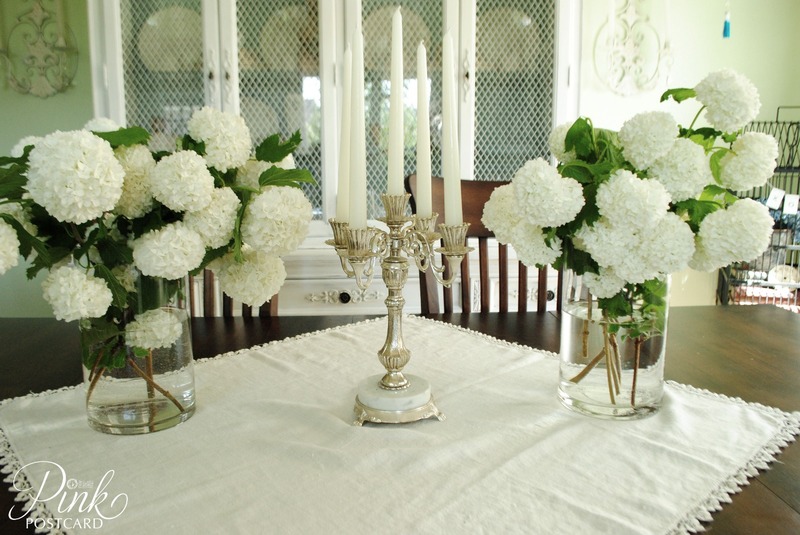 A little romance from the garden to indoors. Are you bringing a little love inside? I love your 'snowballs'...I think I need some of those in my yard. 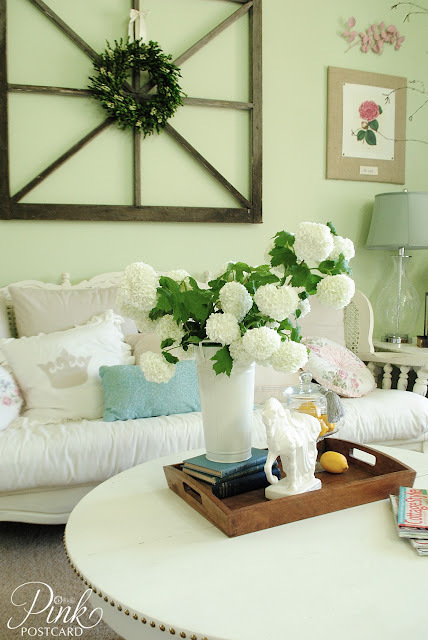 I hope the Farmhouse show was a success...I bet it was knowing all the great items you had for your space. Isn't our weather amazing! Loving it. 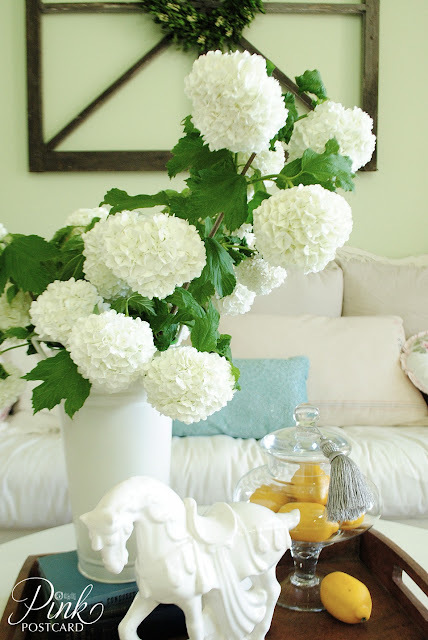 I love the snowballs in the vases! So pretty. I want to see them outside, too. How many do you have, they must be so pretty in the hedge. Gorgeous pictures and those snowballs sure are beauties. 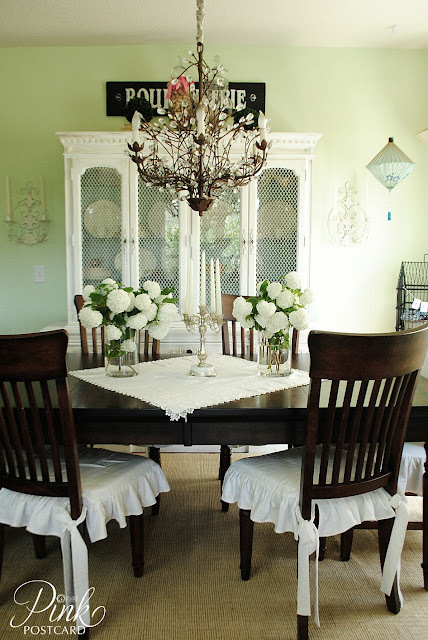 Love the chandelier in the dining room, so very pretty. I grew up with a snowball tree in our yard, yours makes me want to go out and plant one in my yard. I might go looking today. I didn't get to go the the Farmhouse show. I would like to know when and where your next show will be. Or maybe I can drive down to Aunt Bee's and look around. Gorgeous! Summer seems to have arrived in your part of the world. We are still in tulip season here but I am looking forward to when the hydrangeas and snowballs are in flower here, too! I've always liked snowball tree's your dinning room looks lovely. I think your home looks beautiful all year round! And those snowballs, oh my goodness, how gorgeous! Your home is beautiful and I am loooooving those flowers! Oh my gosh those are gorgeous! Wondering if they would grow here in San Diego?? ?hmmmm...need to do some research. Enjoy your week.